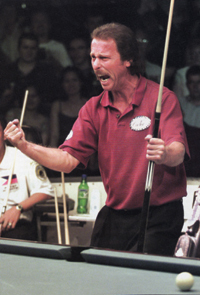 The final of the 2002 World Pool Championship ended with a scoreline that suggested a thriller: Earl Strickland 17, Francisco Bustamante 15. But the magnificence of this battle between two 9-ball greats lies in what each player dealt with when they approached the Gold Crown in the Cardiff International Arena in Wales. Strickland was well aware that this might just be his last chance at making a run deep in a world championship event. The 41-year-old South Carolinian recaptured the form that won him four previous World 9-Ball titles and five U.S. Opens. Winning one more title was vindication - a way for Strickland to show everyone that he was still capable of being a world champion. "This is different than the tournament in '90 and '91," Strickland said, in comparison to his back-to-back titles. "This is the greatest and toughest tournament on earth. My career wouldn't have been complete without winning this event." After burying the clincher, Strickland jumped up on the table, pumped his fist and released all of the tension that had built up over the course of nine days. "King of the world now, ain't I?" he screamed, dismounting the Gold Crown with a final bark, "Heart!" Heart is what allowed him to fight back and clip Bustamante at the wire, despite trailing throughout. But what Strickland might as well have meant was the courage displayed by his opponent, who performed at the highest level while faced with the deepest sorrows. Three days before the final, Bustamante received a phone call from his wife, Mila, in the Philippines. The couple's 7-month-old daughter, Marielle, had died suddenly as a result of a viral blood infection. Bustamante decided to play, though a sullen, distant figure took the place of the perpetually jovial Filipino. "It will be difficult to play," he said, just hours after hearing the tragic news. "My sponsor and my wife said the decision is up to me, but they told me there is nothing I can do at home. It's over. So I decided to stay here and play for my country and for my daughter. "I can't believe she died," he continued, pulling a photo of Marielle from his wallet. "Look, she's beautiful." Strickland ended Bustamante's dramatic title run with a screaming comeback. Bustamante summoned the courage to not only play, but win. Trailing 10-6 in the round of 16, he cleared an open table left by countryman Antonio Lining and ran the next three racks to force a case game. Lining scratched after a dry break, and Bustamante cleared the remaining balls for the win. He beat good friend Efren Reyes in the quarterfinal, 11-8, by running out from the break in the final three games. Bustamante pushed through to the final with another dramatic comeback against Yang Ching-Shun. Trailing 7-5, Bustamante escaped a safety to get within a game, then strung together five consecutive runouts for an 11-7 win that left the crowd standing and cheering, "Django! Django!" What was billed as a final between two power players exchanging big-time runs was in reality an abridged version, with each player taking a rack or two at a time. Strickland held a brief 7-6 advantage, but he erred on the 2 ball, and his Filipino counterpart finally let his famously fluid stroke get loose. Bustamante cleared that rack, then did the same with the next three to seize control of the match, 10-7. With a 15-13 lead, Bustamante scratched on the break and surrendered that game. Missing a jumpshot on the 6 in the next game, the Filipino never saw the table again. Strickland tied it up, then ran out from the break twice for the comeback 17-15 win. "I tried to stay composed," he said. "That's why I didn't watch the table when he was shooting. It's bad karma, because watching and wishing for a mistake only frustrates you." Brave Bustamante kept perspective on his unforgettably courageous performance. "I'm disappointed, but I'm proud," Bustamante said. "I don't care if I win or lose, just play well. Finish doesn't matter. I dedicate this to my daughter."